Sorry, don’t mean to shout. Except that I do. 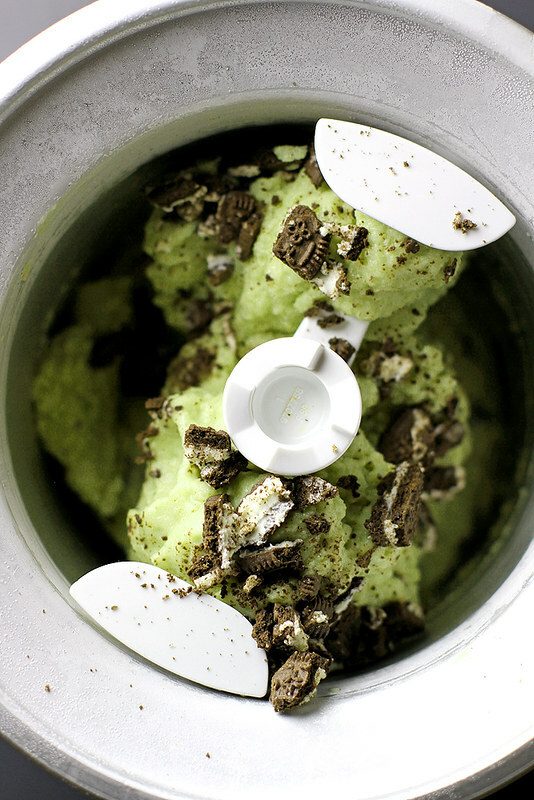 Because totally vegan yet totally delicious matcha mint cookies and cream ice cream is worth shouting about. There is no other way to convey its tastiness except for maybe sharing the fact that I’ve been eating it every day by the scoopful (more accurately, scoops-ful). 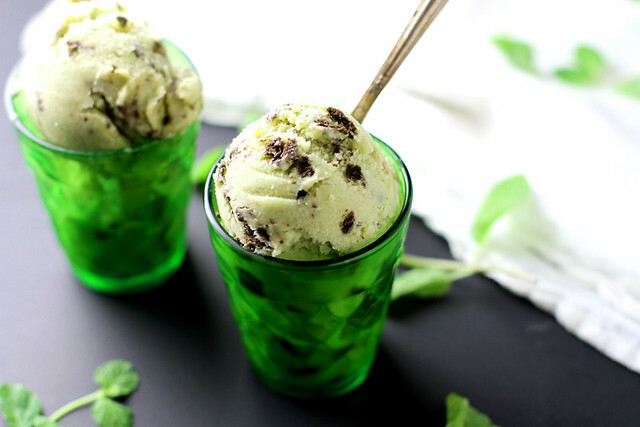 I’ve been meaning to make a matcha mint ice cream for a while — something about that combo has just been on my mind, wooing me, luring me in, lightly tapping on my shoulder saying, “Hey! I need to be a thing in your life.” Except not in a creepy way, but rather a nice, polite, happy ice cream times way. Ahem. And then recently, I also gave in to a bag of mint creme-filled cookies at the grocery store (they, too, were tapping me politely on the shoulder, swears) and when I got home, mouth maybe full of cookie, I had the epiphany: Matcha. Mint. 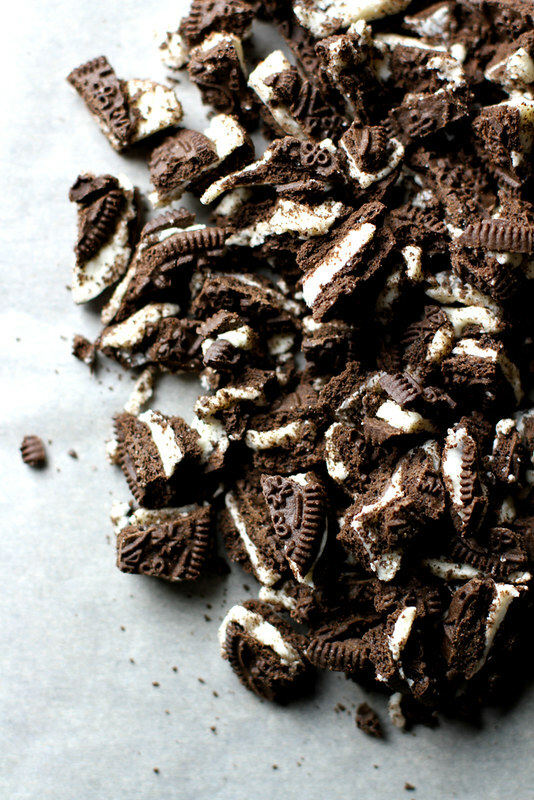 Cookies and Cream. All up in an ice cream. Yes. At first, I had grand plans to make this ice cream the traditional way, with heavy cream and whole milk and all that goodness, but when I found this recipe, made with maple syrup and light coconut milk, I was intrigued. There’s no way this could be ice cream. There’s no way this could taste like ice cream. I had to try it. Well, in case you don’t know where this is going, I’ll tell you: It DOES taste like ice cream. OK, I will admit it is a wee less creamy than regular ice cream (it’s almost like a sorbet, as the husband noted), but even then the flavor, the consistency, the cool matcha mint-y freshness with bits of creme-filled chocolate cookies is all there. 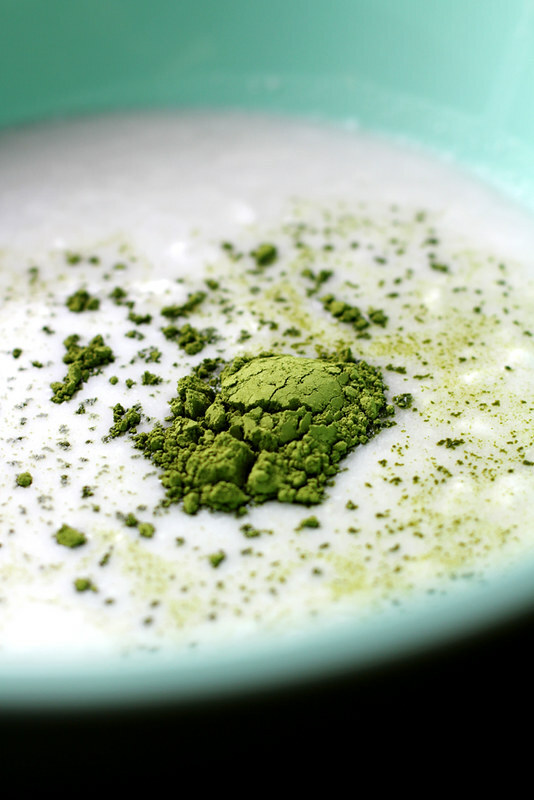 The matcha not only lends color but a little bit of its savory flavor, too; the mint extract is subtle but refreshing; and the chocolate sandwich cookie bits? Those are my favorite part, because I like a little texture and crunch in my ice cream and these deliver both, plus a lot of chocolate yums. If it is (FINALLY) springtime by you like it is here, I say it’s high time for ice cream. Maybe with a scoop or two or three in a cone outside, on the lawn, with the sun on your pasty winter face (← that’s me, guys. So very pasty). In a blender (or a large bowl using an immersion blender), blend coconut milk, maple syrup, mint extract and matcha powder until well blended. If using a blender, transfer mixture to a large bowl. Cover bowl tightly with plastic wrap and refrigerate 2 hours. Pour chilled mixture into an ice cream maker and churn according to manufacturer’s instructions. Add chopped cookies during last 1-2 minutes of churning. Spread churned mixture evenly into bottom of a loaf pan, Tupperware or bowl; cover tightly and freeze at least 2 hours until firm. AHHH!!! Love matcha right now and the combination of it a VGEAN dessert?? Delicious and so refreshing. 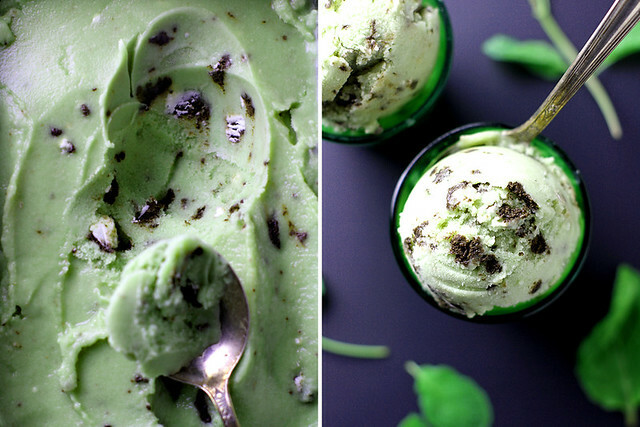 Mint cookies and cream ice cream might already be one of my favorite flavors of ice cream, but matcha along with it!? Brilliant. I’m so happy it’s finally spring to stay, and we’re getting warm weather here so I’m totally with you – it’s time to celebrate with ice cream! 🙂 Happy spring Stephanie! This can be done w/ light coconut milk??? I AM IN. Extra cookies please! Oh all the yeses! Love this combo. 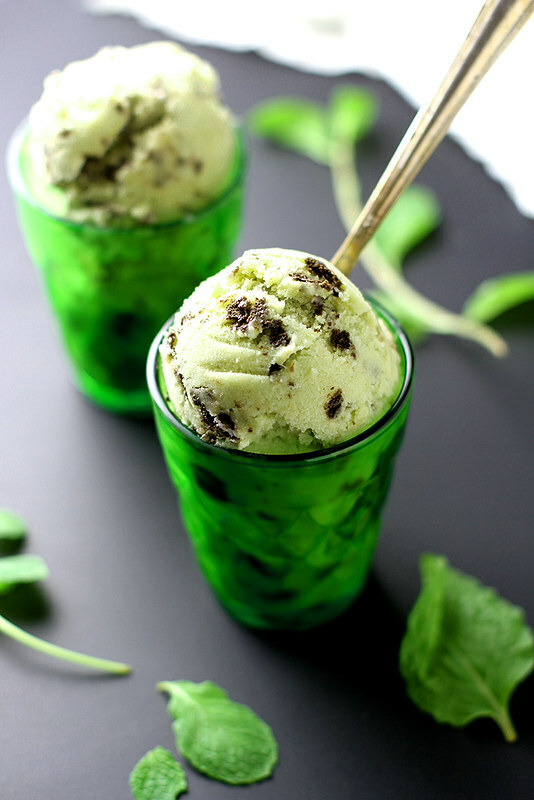 And heck yeah to mint ice cream that is a pretty green color without the need for green food dye! Ooooh it’s veegs! How fun. I have yet to bake with matcha, but after seeing it all over the place I feel like I just need to! I feel very deeply that this needs to be in my life. I’m crying inside right now because I don’t own an ice cream maker, nor do I know anyone who does! Boo! This looks lovely! Oh there is something just great about this combination!! The green tea, the fresh mint, oh and the cookies. Lovely!!! This is right up my alley! I love love mint chocolate chip ice cream and this looks pretty similar. Yum! Goodness me this looks good!! I love the idea of matcha and mint and of course cookies! All you had to say was matcha and I would have been won over, but adding cookies and cream into the mix is just GENIUS. You always seem to know just what I’ll love. Matcha, mint & cookies and cream? What a DELICIOUS combination. Gaaahhh! 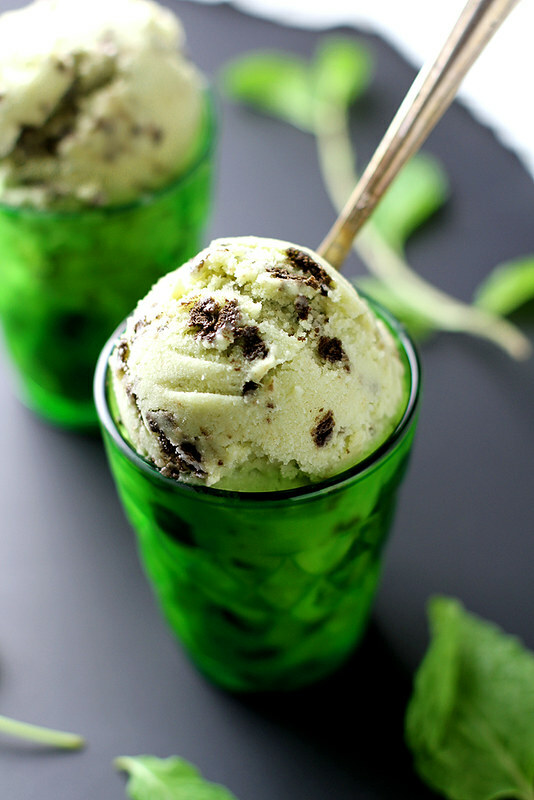 You had me at vegan matcha mint ice cream! But the mint flavored cookies and cream is next level. YUMMM. Oh mah goodness–yes! I am so ready for ice cream and all things cold and frothy. I busted out the iced coffee a few weeks ago out of pure excitement for warmer weather. Love this vegan ice cream. Pinned. I cannot for the life of me believe how this can be vegan!!! Also the light coconut milk is genius. Yum! I tried this today and it was a huge hit in our household- I even tried my own version with banana instead of the mint, and with choc cookies. You could probably turn this into a smoothie or shake by blending it and adding some more milk. 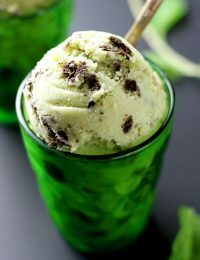 Being a vegetarian, really loved this ice-cream recipe! While browsing about more of such recipes, I came across one where banana was combined with peanut butter. I don’t like peanut butter and so this one is far better! I’ll try it. Pinning it!